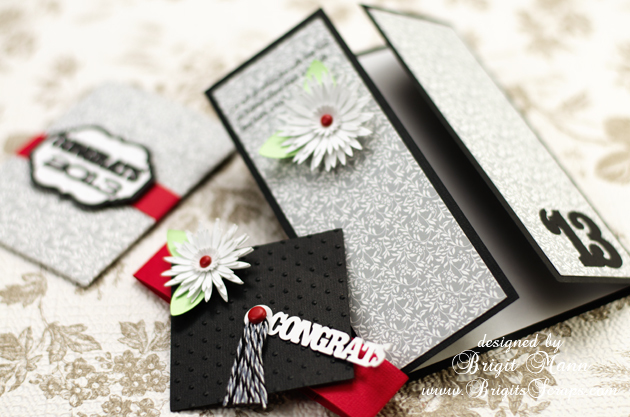 Here's a great graduation card from Lori Whitlock's store, love the gate fold with belly band. I added the flowers from the 3D flower set 5 and did a print and cut for the sentiment on the panel. The little flat bag is perfect for a gift card, it's so cute, I love it!! The label on the bag is from the bracket labels set and the congrats and 3013 is from another graduation card. The Trendy Twine is Midnight, so classy, definitely a must have in your stash and the pattern paper is from Echo Park's Just Married Mini Collection. Here's a picture with the belly band off. This is awesome Brigit! What a GREAT set!!! Such a fabulous set. Love it.